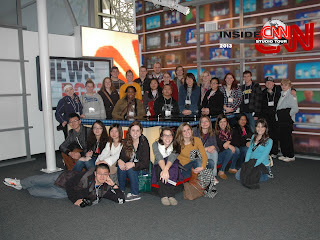 We started out the 10th Civil Rights Pilgrimage by visiting the CNN World Headquarters in Atlanta on Saturday! Students got to see behind the scenes (literally) of one of the world's largest news organizations and learn about how the media selects the information that it broadcasts. After having some free time in Atlanta we were able to hear from an original Freedom Rider, Mr. Charles Person, at Morris Brown College. His inspiring message was great to hear and we also enjoyed our first Southern meal of the trip!